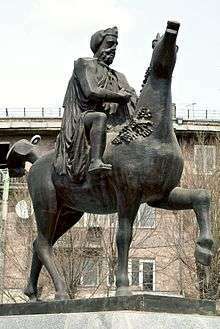 Ashot III (Armenian: Աշոտ Գ) was a king of Armenia, ruling the medieval kingdom of Armenia from 952/53-77. Known as Ashot III the Merciful (Աշոտ Գ. Ողորմած) and acknowledged by foreign rulers as the Shahanshah (king of kings) of Mets Hayk' (Greater Armenia), he moved his royal seat of residence to Ani and oversaw its development and of the kingdom as a whole. Armenia reached the height of its golden era during his reign and that of his sons and successors, Smbat II (977–89) and Gagik I (990–1020). 1 2 Manuk-Khaloyan, Armen, "In the Cemetery of their Ancestors: The Royal Burial Tombs of the Bagratuni Kings of Greater Armenia (890-1073/79)," Revue des Études Arméniennes 35 (2013), pp. 147-48, 164-65, 171-72. ↑ Garsoïan, Nina G. (1997), "The Independent Kingdoms of Medieval Armenia" in The Armenian People from Ancient to Modern Times, Volume I, The Dynastic Periods: From Antiquity to the Fourteenth Century, ed. Richard G. Hovannisian. New York: St. Martin's Press, pp. 164ff. ↑ Aram Ter-Ghevondyan (1976), The Arab Emirates in Bagratid Armenia, trans. Nina G. Garsoïan. Lisbon: Calouste Gulbenkian Foundation, pp. 95-96. ↑ (Armenian) Arakelyan, Babken N. (1976), "Բագրատունյաց թագավորության բարգավաճումը," [The Flourishing of the Bagratuni Kingdom] in Հայ Ժողովրդի Պատմություն [History of the Armenian People], eds. Tsatur Aghayan et al. Yerevan: Armenian Academy of Sciences, vol. 3, pp. 52-57. ↑ Treadgold, Warren (1997). A History of Byzantine State and Society. Stanford: Stanford University Press. p. 511. ↑ Garsoïan, "The Independent Kingdoms of Medieval Armenia," p. 166.